321-615-7626 Get Your Wedding Featured! Many brides walk down the aisle in white gowns, which have long been considered the most traditional choice. 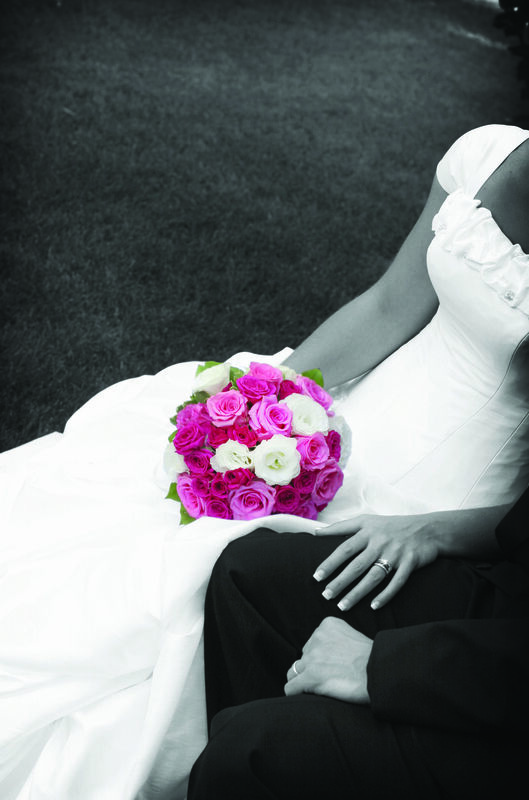 Wearing white can be a frightening prospect to some brides, who fear that white clearly shows every blemish or stain. Protecting a white dress so it looks pristine on one’s wedding day takes a little effort, but such efforts are well worth it. When trying on the gown, be sure that your hands are clean and you are not wearing any makeup. You may want to wear a thin pair of gloves so any oils from your hands are not transferred to the gown. If anyone helps you in and out of the gown, ensure their hands also are clean. Try on the gown sparingly before the wedding, ideally only for fittings. When you are not trying it on, store it in a protective garment bag until it needs to be steamed just prior to the wedding. Some seamstresses or tailors will hold onto the gown until the final alterations are done and then steam out any wrinkles prior to delivery. On the day of the wedding, resist the urge to handle the gown early in the day. The gown should be the last thing you put on during wedding day preparations. Wait until just before departing for the service to get fully dressed in your gown. Again, make sure your hands and the hands of any helpers are clean. Ask for help so that the gown can be placed gingerly over your head, avoiding any makeup in the process. Some brides may find it helpful to leave lipstick application for the very last step in getting ready. Should an accident occur, bright lipstick on the white gown can be especially difficult to conceal. Pack an emergency stain-fighting kit to bring along to the ceremony and reception. This way, should a minor stain occur, it can be treated right away. Use sparingly because you will not know just how the cleaning product will react with the gown’s fabric, and overuse may make the stain worse. If possible, test the product on a small swatch of gown fabric prior to use. Use caution when removing the gown and then promptly repackage it into its garment bag. After the wedding, take the gown to a professional dry cleaner to have it cleaned and preserved. Then the gown can be used by future generations or simply saved as a keepsake. White gowns are traditional wedding fixtures. Brides-to-be can keep their gowns looking beautiful throughout and after the wedding.